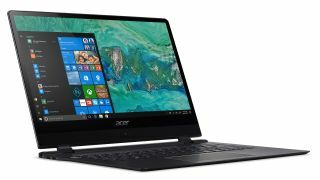 Over at CES 2018, Acer has revealed an even thinner Swift 7 Ultrabook, as well as announcing the availability of a new spin on the Switch 7. The Swift 7 was already incredibly thin and light, but Acer has slimmed it down from just over 10mm to an exceptionally trim 8.98mm. The ultra slim Ultrabook will stick with last generation Kaby Lake Core i7 processor, but its Full HD display has increased in size from 13.3-inch to 14-inch. This time around the display is also a touchscreen fitted with a Corning Gorilla Glass facade. Acer has also brought built-in 4G LTE connectivity to the notebook, with the antenna neatly integrated into the all-black aluminum unibody chassis, helping to ensure a better signal for your mobile broadband (although speeds will be dependent on local signal strength, of course). The new Swift 7 delivers a claimed battery life of up to 10 hours, slightly more than its predecessor which ran for an estimated nine hours. In our review, we found longevity to be one of the laptop’s weak spots, so any extra pep on this front is obviously welcome. Hopefully, this will translate to even better results in our own battery benchmarks when we actually get to play with the refreshed model. Fingers crossed and all that. Expect the new Acer Swift 7 to emerge in April, with the price starting at $1,699 (around £1,250, AU$2,160). Compared to its predecessor, this new model is considerably more expensive. You may recall that Acer unveiled its Switch 7 Black Edition at IFA 2017 last September, and we got to go hands-on with the hybrid, finding it to be an impressive piece of tech, boasting a discrete GPU (GeForce MX 150) and liquid cooling. The news from CES is that this 2-in-1 is now on sale in the US with the price starting at $1,699 (around £1,250, AU$2,160). Again, that’s no small outlay, and we’ll certainly evaluate the value proposition of this hybrid in our full review.